Two individual Governors found their way to the podium on Saturday. In the 100m dash, sophomore Tymeitha Tolbert’s 11.67 mark gave her third in the event, three-hundredths of a second behind second-place Lisa Wickham of Tennessee Tech. Tolbert’s bronze marks the fifth consecutive season at least one Gov has found the podium in the 100m dash. Freshman Sabrina Richman picked up the first of two medals for herself on the day, blazing a 54.79 path to a third-place finish in the 400m dash; she’s the first Gov with a 400m medal since Terri Morris in 2016. Senior Allysha Scott (sixth, 56.51) and sophomore Amelia Thiesing (seventh, 56.60) also picked up points in the 400m event. 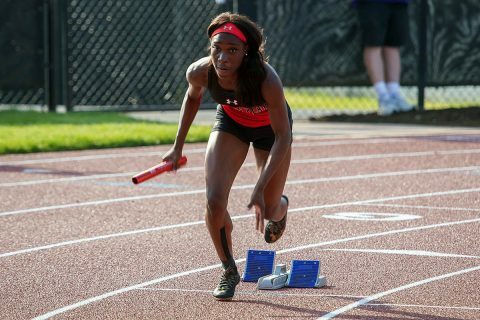 The Governors 4x100m relay team entered the day as a favorite in the event, but an injury to freshman Lennex Walker set off a chain reaction that altered the Governors destiny. Not only did the Govs go from favorite to out of the top-eight in the relay, Walker—a favorite in the 100m hurdles and a top qualifier in the 200m dash as well—had a heavily-bandaged leg that left her barely able to walk, let alone run. That did not stop Walker. Already qualified for the finals in both events, Walker merely needed to finish in order to secure points for the Govs and she gamely labored down the track for the Govs to cheers and exultation from her teammates. Richman (fifth, 24.99) and Tolbert (seventh, 25.27) also secured points for the Govs in the 200m dash. Redshirt freshman Maya Perry-Grimes snared a point in the day’s first event, leaping 11.91m (39-1.0) in the triple jump for eighth place. Although she unfortunately finished just outside the top-eight, junior Emmaculate Kiplagat won the first heat of the 5000m run with an 18:27.13 mark, finishing 11th overall. In the final event of the championships, the Governors sent out Richman, Thiesing, Scott and freshman Allana Johnson in the 4x400m relay; that quartet’s 3:45.85 was their second-best mark this season and secured bronze—the fourth time in the last five outdoor seasons the Govs have found the medal stand with the day’s final event. Only junior pole vaulter Savannah Amato is guaranteed of competing in the 2018 NCAA East Preliminaries; for Tolbert, Perry-Grimes, and vaulters Morgan Bradley and Dascha Hix, they’ll await to find out their fate in the coming weeks, based on athletes declaring for events. The 2018 NCAA East Preliminaries will be hosted by USF in Tampa, Florida, May 24th-26th.